Sometimes bad things happen to good people. I like to think of myself as a good person, and I like it a lot when bad things do not happen to me. Sadly this is a tale of a bad thing (this wine) happening to a good person (me). I like sherry, I’ve probably mentioned that. Manzanilla, Fino, Palo Cortado, Amontillado, Oloroso, PX, they all bring me great joy. I’m mostly confined to the pale, dry, zippy end of that spectrum through the year, but in the winter months I’m able to creep up the sweetness chart now and again without faces being pulled at home. 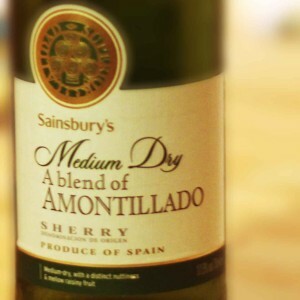 In February I thought I’d be safe with an Amontillado. I picked up this bottle, looking forward to dry, nutty, warming winter flavours. That’s when the bad thing happened. I had not read the label, I had not looked closely at the label, I had paid no attention whatsoever to the label, and I was punished for my recklessness. I had bought … blended sherry. Go ahead, laugh, but one day this might happen to you. You could be in a hurry, distracted by a child pulling bottles from the shelf, or you could head to the store without your glasses, and you could buy blended sherry, and then you won’t be laughing. You’ll be wailing, gnashing your teeth and swilling your mouth out with Pinot Grigio. Blended sherry isn’t quite at the depths of “British Fortified Wine”, or British Sherry as it was known when Blue Nun was the height of sophistication in Britain, but it is it’s Spanish cousin. They take perfectly good sherry and add stuff to it, mostly sugar, and make it taste unpleasant.